This week, developer Todd Blue of Cobalt Ventures and owner of a series of 19th century buildings on West Main Street dubbed the Iron Quarter announced his intention to tear down the historic properties citing the buildings’ deteriorated condition. Blue had once planned a $50 million mixed-use center for the site which involved tearing down the guts of the building and saving the facades, a practice referred to as facadectomy. After a report funded by the Downtown Development Corporation (DDC) suggested that the structures could potentially be saved if appropriate action was taken to stabilize the buildings, Mayor Abramson stepped in to negotiate the sale of the buildings. Blue was dismissive of the DDC report claiming it was done by an outside party and lacked comprehensive data. At the time, he said he did not personally know the condition of the buildings. Abramson had arranged several potential buyers who planned to restore the buildings and had met with Blue to strike a deal to sell the historic properties. The Mayor says the Iron Quarter buildings are important to the history and urban fabric of Downtown and because of their proximity to the new arena, they shouldn’t be squandered. The Mayor’s Deal would have allowed Blue to break even on his $4.3 million investment in the Iron Quarter dating to 2007. Two months later, the deal has fallen through and Blue appears unwilling to sell. Calls to Cobalt Ventures for comment were not returned. Chris Poynter in the Mayor’s office said Abramson is disappointed the deal has fallen through and doesn’t look forward to the proposed demolition. Leonard’s report further details deteriorated or partially collapsed floor decking, water damage, and deteriorated roofing in various Iron Quarter buildings. These observations are in line with those made in the DDC report. The Leonard report was skeptical that some of the buildings could receive new roofs due to deteriorated parapet wall conditions. The report concludes that “[t]here is no doubt the existing collapsed areas throughout the buildings are a result of water infiltration due to the poor condition of the roofs.” It speculates that a series of collapses could happen at any time and recommends demolition of the structures. It was pointed out on Broken Sidewalk in 2008 that there were large holes in the roofs of the Iron Quarter buildings allowing water to pour into the structures. There’s no worse enemy to a building than water penetration. Both the DDC report and the Leonard report seem to condemn Cobalt Ventures for not properly maintaining the Iron Quarter buildings by acknowledging the inadequate maintenance to the roof as the predominant deterioration factor. Louisville currently has an Abandoned Urban Property program through the Department of Housing meant to discourage neglected properties by increasing property taxes three-fold on structures vacant for a year or more that are uninhabitable or have accumulated trash through neglected maintenance. The Iron Quarter was never placed on the list although it clearly fits the criteria. I placed a call to the DOH and will have an update next week. Now that Blue has requested to demolish the Iron Quarter, a process that could take two months or more will begin to play out. Because the Iron Quarter sits within the boundaries of the Waterfront Development Review Overlay District (WRO), the Waterfront Development Corporation (WDC) must first approve or deny the demolition permit. After the WRO receives the appropriate paperwork from Cobalt Ventures, a meeting to evaluate the permit’s merits will take place. That first step could take two to three weeks. According to the WDC website, the WRO works with a team of architects from the AIA-KY to determine whether to approve or deny the permit. Historic preservation has won battles in the past that went before the WRO including demolition denials for the Paget House and the Heigold Facade. If the WRO does approve the permit, a 30 day moratorium goes into effect before actual demolition can occur. In all, this nearly two-month window will give preservationists the opportunity they need to save the Iron Quarter. Already, preservationists and neighborhood activists are mounting plans to save the block. The greatest defense against demolition is declaring the buildings Louisville Landmarks, a process that involves collecting 200 signatures and paying a $500 fee. Unfortunately, each of the six buildings threatened in the Iron Quarter must be declared a landmark, resulting in a fee of $3,000. If landmarked, demolition would then require approval of the Louisville Landmarks Commission and likely would require Cobalt Ventures to prove economic hardship. Marianne Zickuhr, Director of Preservation Louisville, said the petition and fundraising effort is already underway. She pointed out that May is National Preservation Month and expects a large turnout in support of the Iron Quarter buildings due to their high profile in Downtown. 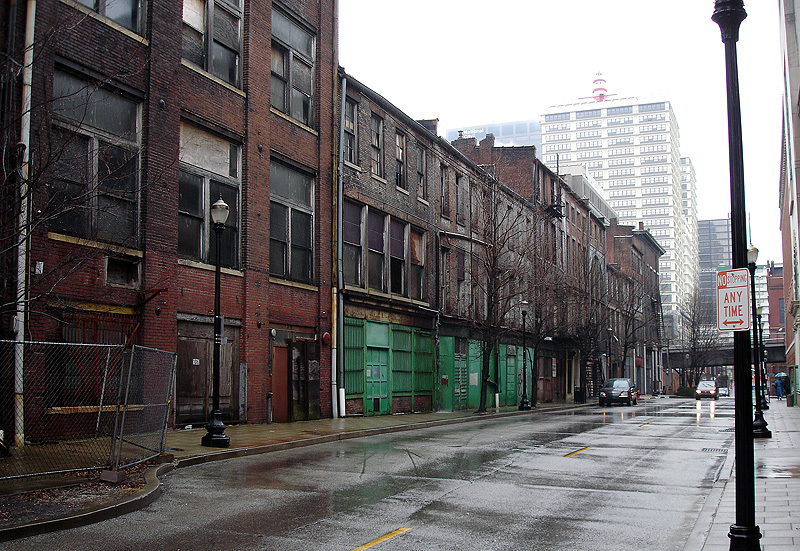 The Iron Quarter buildings made it onto Preservation Louisville’s 2009 list of most endangered buildings. Anyone interested in signing the Landmark petition or donating to the effort can contact Marianne at director (at) preservationlouisville (dot) org and request a petition sheet to print out and distribute to friends and neighbors. In recent years, the Bauer’s / Azalea’s Restaurant building and the American Standard Building were declared Louisville Landmarks to prevent demolition. Preservation Louisville is planning to release their 2010 list of most endangered buildings at a press conference at 10:30 a.m. on May 18th in front of the Patrick O’Shea’s on the same block as the Iron Quarter. Petitions will be available for signing at the press conference. I think it’s safe to assume the Iron Quarter will appear on this year’s endangered list as well. Before then, two events planned on Tuesday, May 4th will draw attention to the plight of the Iron Quarter. At 4:00 p.m., Neighborhood Planning and Preservation will be holding a Strategy Meeting to save the Iron Quarter at the Whiskey Row Gallery at 131 West Main Street. Topics include an update on the demolition process, information on the petition drive, input from adjacent property owners, and info on a Trolley Hop public awareness event sponsored by Bill Weyland, Valle Jones, and Stephen Jones, developers of the Whiskey Row Lofts on the same block. Attendees are asked to RSVP to npplouisville (at) aol (dot) com or by voicemail at 502.713.5573. Later on May 4th, Preservation Louisville will be holding its Preservation Neighborhood Council Meeting at 5:30 p.m. at the Brennan House at 631 South Fifth Street. Information on the demolitions and how to get involved will be discussed, and I’m sure petitions will be available to sign. To stay informed on the latest news regarding the Iron Quarter’s fate, supporters have created a Facebook group called “Save the Iron Quarter!” In about a day, the group has already attracted 175 supporters. Another more drastic option is still on the table as a last resort effort, although no one seems excited to talk about it. Metro Louisville has the power to condemn the Iron Quarter buildings as blighted, an action that hasn’t happen in Louisville for some time. An agency called the Land Bank Authority was established in 1988 to take over neglected and distressed properties and sell them to developers. Then, hypothetically, the city could sell the series of buildings off to parties interested in preserving the structures that emerged during the Mayor’s Deal discussions. That option, no doubt, would lead to more delays and possible lawsuits. Blue has touted his record as a preservationist noting several conversion projects he has undertaken in the east Downtown area. He is undoubtedly nervous of collapse after part of a historic building on East Market Street he was working on collapsed during construction. If the demolition of the Iron Quarter does proceed, Blue will also have on his record the destruction of one of the largest historic sections of Downtown in recent memory. It’s clear that simply adding a roof in 2007 to the Iron Quarter buildings (a cost the DDC report estimated at around $500,000 this year) could have protected them from further decay and structural instability. It’s unfortunate that the buildings were neglected years before Blue took ownership and continued to be neglected under Cobalt Ventures. The best move for the community would have been if Blue cashed out of the Iron Quarter and took Mayor Abramson’s advice on selling the properties. Details on the breakdown of Abramson’s attempts to broker a sale of the Iron Quarter are not available. Blue must recognize the value of the land adjacent to the arena and the potential profit from redeveloping the area. In that case, breaking even might be seen as a loss. 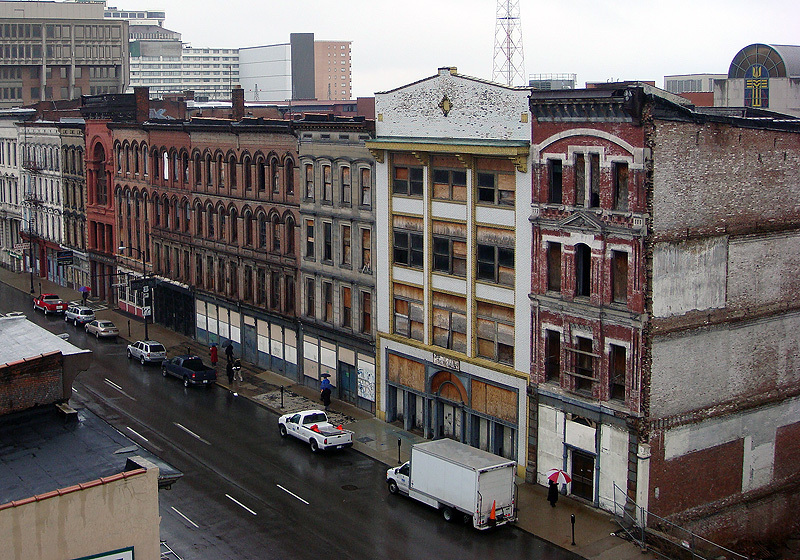 Saving the Iron Quarter block is one of the most significant preservation battles in Louisville’s recent memory, but there are certainly some community leaders who don’t want to see the buildings torn down. With the support of the community and the rejuvenated economy spurred by the arena in the area, hopefully some favorable resolution will come forward. What a huge hole this will leave in the collection of architectural history we have. I can’t think of many other blocks like this…only a few more farther west. Hopefully, this won’t happen. I live downtown and run past these buildings every day and I can feel the historical energy coming off them…what a heartbreak it will be to see them go! Surely, there must be some way to save them!!!!!! Is there any possibility that the facades would be saved or are we talking about a wholesale leveling of the block? Is there any possibility of selling a couple of the buildings to a developer willing to invest in their preservation to avoid a total loss of half of the block? Blue’s lawyer told the press that he would like to save the facades “to the extent that’s possible.” It’s expensive and complicated to brace such a large stretch of facades like this as they are very delicate and the buildings are in such poor shape. In my opinion, if the demo permit goes through, the entire site will be clear cut. No facades left. By rejecting the Mayor’s offer, I think Blue has made it clear he is in it for the money. He has a site that’s valuable and if the buildings are town down, he can just sit on it until another idea comes along. The fortunate thing in this case is that it seems to have sparked some interest in the community and has a fighting chance of being saved. The Mayor wants it saved. DDC wants it saved. The preservationists obviously want it saved. And to top it off, there are unnamed developers interested in purchasing and refurbishing the property. What’s the history of the block? Why is it called the Iron Quarter? Thanks so much for the heads up. I’ve contacted Marianne with my “digital signature” for the landmarks petition. Thanks for the article Branden, just sent an email to Marianne and joined the Facebook page. This one is not going down without a fight! The Iron Quarter is the name Cobalt Ventures chose for the failed mixed-use project / office tower that was once proposed for the site. It reflects the fact that many of the buildings have cast-iron building elements and that the proposed interior would feature exposed steel structure. Several people have also told me that the block has historically been called the Iron Quarter, but I can’t pin down any definite references. Anyone have any suggestions? Thanks Chuck and Dan for getting involved. I believe the city requires “analog” signatures to be counted, but that shouldn’t be too difficult. It was never referred to as Iron Quarter until coined by Cobalt Ventures. I’ve always referred to it as Louisville’s “forgotten block” (along with the 500 block of Fourth St)due to the complete lack of attention by the Abramson administration. There’s a lot of historical info about this block on the NRHP, look under “Brown, J.T.S., and Son’s Complex”. I am not an attorney, but didn’t the Supreme Court recently rule that cities can use Eminent Domain to force a property owner to sell to another private entity if the city believes it is in the city’s developmental interests? I didn’t like this ruling when it happened, and still don’t, but it’s also the law of the land, and if it’s a tool that can be used, and we arrive at a last resort point, why not use it? Love your blog. Keep up the great work promoting Louisville’s storied past. So important for our future! Steve, the gist of the ruling in Kelo v. City of New London was that eminent domain could be used to condemn private property in order to give that property to a private entity for the benefit of the public. Its vague, and a gray area. Larry, I don’t know the answer to your query, but I do believe that if we lost that 2nd place status, it could severely cut into the potential for history tourism, especially as we’re trying to figure out how to get more people to visit the city. I think this is partly why Abramson is behind saving the buildings. He surely knows that Louisville would be widely condemned by opinion leaders around the country if we let these buildings be torn down. Everyone would know that Louisville is starting to not care about its greatest treasures. Thanks Ed for the clarification. Larry & Steve, I have spent the last few days researching the cast iron issue. I’ll have something online about it Monday. I sometimes wonder how much of the city’s decline (relative to other cities) since the mid-20th century can be attributed to “urban renewal”. I heared Museum Plaza will be under const. by 2015!! Is it believable for Blue to claim “financial hardship” if he has been offered a deal that ensures he will not lose his original investment? Does this situation have some similarities to the Frank Faris / Frankfort Ave. fiasco? He won’t lose his original investment, but that isn’t all he’s paid out on the buildings, he’ll still take a major loss if he sells at that amount. But at the rate they are going, the buildings are likely going to just fall down and solve the whole problem. Todd is playing with fire. It isn’t just his legacy as a builder, but also his ability to work with others in this city that he is endangering. I think we should save the buildings, or at least the facade, if possible. The old buildings from the turn of the 19th century have too much character to be thrown away. I hope Mr. Blue can find a way to make money without demolition. Historic preservation of buildings is an important part of American culture; I completely understand saving buildings. However buildings have and always will be designed and built using materials which don’t have infinite life. Its important to understand certain buildings are designed to survive longer, for example government / public use building. In the above situation regarding Iron Quarter, the buildings are in complete demise, regardless of who is at fault. In addition, parts of the facades are in a deteriorated state; saving the facade for reuse is dangerous, expensive and requires selection. For example The Marriot located at Third and 284 W Jefferson is a good example of selective facade preservation; the stone work of the existing facade was removed and numbered and incorporated back into the design and reassembled like a puzzle. In addition the facades located at the public entrance for the future Museum Plaza were preserved using bracing. However these buildings were not as deteriorated as the Iron Quarter buildings. Several of the Iron Quarter facades have horizontal sag and the underlying foundation has obviously settled unevenly. To mandate these facades be saved in there entirety is a detriment and deterrence to the actual preservation of them. To encourage the preservation of these facades a solution should be achieved which saves the design of the facade and does not cause an extreme financial burden which, would discourage developers / investors. The solution for this situation is a combination of selective preservation and complete demolition. Virtually all the iron pieces which comprise the facades can be removed, refurbished and reused. In addition the majority of the stone work can be saved, numbered refurbished and reused. However the structure supporting these facades elements should not be saved as they are a threat to public safety. In addition all the brick should be abandoned, as brick is constantly under compressive stress and the combination of water damage has destroyed a substantial amount of the supporting mortar. Through the use of several of the agencies listed in the above article, a design mandate could be enacted which would require future developers to incorporate exact replicas of the existing Iron Quarter facade into any future project on the above site. It would require the Iron Quarter facades be rebuilt by using the existing preserved materials (iron and stone) and new materials. This solution would protect public safety, preserve the design of the Iron Quarter facade and not place a financial burden on future developers which would discourage them from investing into a solution to preserve the facades. Jason, why was O’Shea’s able to renovate without any problem on the same block? “The the buildings are in complete demise” — and your independent engineering evidence is…? The building’s facades are important, the scale of the buildings are important, I support these causes and efforts. However I offered a solution for resolving the concerns for both parties; parties being the public “us”, government and the developers. My independent engineering evidence in non existent, however I based my evaluation on my experience from my architectural career and the experience it’s granted. Yes any building can be saved if there is enough monetary funding invested in the project, however there is thin line between preservation, economic development and owner desire. The O’Shea’s project appears to have worked because of its location on the block and less deterioration, the occupants, it use and the desire of the owners; the key component is the desire of the owners. It’s highly unlikely there are 8 more O’Shea’s lined up to invest in these spaces, if there are, then awesome. The buildings to the west of O’Shea’s appear to be more structurally sound then the buildings to the east side of the block. The building on the far east end is positioned to collapse. Load bearing masonry is great in compression however not tension, considering the interior timber beams are most likely rotten, the masonry can not support itself from shear forces. Given more time this building will fall; there are no shear walls or braces in place to support this building. Let’s review my solution; strip the facades of what is architecturally important. For example the iron decorative work, the stone sills arches and keystones. Brick is not as important, brick work is (document it) the timber frames are great however if deteriorated, they are disastrous. If there are no existing as built construction documents in existence then these facades need to be documented, by either manually measuring and drafting them, or using 3d / weaving / scanning software to scan the buildings and their proportions. Based on the information provided in the article it appears the owner doesn’t have any desire to save these buildings; in these situation there should be comprise to encourage the the preservation of the buildings. Yes I care about our greatest treasures, this is why I offered a solution to save the architectural design before they collapse; once they collapse saving them becomes even more difficult. It might be a solution some many not agree with, however it would preserve the architecture vernacular of the Iron Quarter. Jason, I accept your solution as an idea to be considered as a last resort. However, until we have independent engineering examinations of the buildings and all other approaches exhausted, we’re not at the last resort stage. As for owner desire, if the owner’s desire doesn’t match up with the desires of the community and the posterity of the city, and the buildings are found to be in good enough shape to be rehabilitated, there’s going to be a fight. Just another example of our illustrious “Mayor for Life” asleep at the wheel. In Europe you seldom see historic buildings torn down, just reused. Why Louisville lets this happens is beyond me. Where is Dave Armstrong when we need him? Hell, we needed him a long time ago and Jerry proceeded to screw us all. Face facts, these buildings are members of the photo archives at UL because that will be the only place they will be seen next year. Maybe the Blue Brothers will build another thalidomide baby of a building like “The Point” where these beautiful, historic building now stand. This is easy. Demolish the unsafe/unsightly buildings then require their replacements to be in the same historic style. I’ll bet its quicker, safer, and maybe even cheaper than trying to save a worn out useless structure.